Whatever your dream, Goal Mapping can help you achieve it. Goal Mapping works to develop the empowering mindsets, winning attitudes and effective habits that create success in an individual, a team or even an entire community. The Goal Mapping system was developed to help you choose, set and achieve goals more easily and more successfully. But where traditional goal-setting techniques focus on left-brain words and endless repetition, Goal Mapping also uses imagery – the language of the subconscious. Goal setting is possibly the most powerful skill that a person can have. It is the master key for unlocking success in any area of life. Whether you dream of achieving financial freedom, a more balanced lifestyle, extraordinary levels of health and vibrancy or excellence in your professional and personal life, when a firm goal is made, captured with an effective goal setting tool and vital daily steps are taken, the potential to achieve is limitless. Whatever you dream of, goal setting can help you achieve it. Goal setting is a natural function of the brain. Each time you make a decision it triggers a subconscious process that transforms the decision into a deed. Learning the most effective way to set goals is the number one prerequisite for success in any endeavour, whether it’s for your personal life, professional life, or for your team or organisation. In the past many traditional goal setting techniques have focused on left-brain words and endless repetition, however effective goal setting tools use right -brain imagery – the language of the subconscious. To maximize the impact of your goals onto your subconscious mind, it is vital to create visual representations of your goals through an effective goal setting tool such as Goal Mapping. This unique ‘whole-brain’ approach is designed to connect your consciously chosen goals to your subconscious mind. Your subconscious works like a helpful autopilot. Once a conscious decision or goal has been set, a sub-conscious process is triggered that begins to influence the transformation of that decision first into an attitude, then into an action, and ultimately into to an achievement. By creating a Goal Map, you develop a clear plan of what you want, why you want it, when and how you intend to achieve it and who will support you in the process. Underpinning your Goal Map is a philosophy of success that comprises seven core principles. By learning these and the system’s other key ideas – which are as much a part of Goal Mapping as the Goal Map itself – you’ll become fully able to steer your life towards the achivement of your goals. This simple yet powerful system is so effective that Goal Mapping has touched the lives of more than 4 million people in over 30 countries over the last 20 years or so. In essence, Goal Mapping is a unique, multipurpose human empowerment tool. It can be applied in a number of ways to achieve a variety of different objectives for yourself, businesses, groups and teams or children. It is used by everyone from world-leading businesses, schools and sports teams, to wellbeing practitioners, weight-loss experts and world-champion athletes as well as countless individuals. So, whatever form of success you seek, Goal Mapping can help you turn your dreams into realities! Carolyn is a Life Success Coach, motivational speaker and advocate of the science of positive thinking and goal achievement. Throughout her career, she has been inspiring and motivating children, teenagers and adults to realize their full potential, to believe in themselves and their dreams and to unlock their personal power towards self-confidence and succcess. Her message of self-worth, vision and personal power comes from her real-life experience of turning obstacles into opportunities and challenges into triumph. The combination of Carolyn’s professional experience (EFL teacher, Personal Development Coach) and her own life’s lessons, have become the foundation of her coaching business philosophy, which is based on a deep commitment to motivate and support people in creating a more balanced, authentic and fulfilling life. Carolyn graduated from the University of North London with a BA (Hons) Degree in Humanities and further qualified as an EFL teacher. She was employed by the British Council in Athens (teaching English as a foreign language) and also joined the European Commission Training for Conference Interpreters programme at Panteos University where she monitored and assessed the quality of English of trainee interpreters. 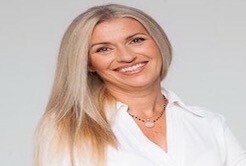 In 2009 she resolved to further enrich her professional career by studying to become an NLP Master Practitioner, Personal Performance Coach and Goal Mapping Practitioner. Carolyn’s greatest joy is to help people ‘shine their light’. Her core work revolves around the art of goal setting, in particular Goal Mapping, as she strongly believes that mastering this is the first step in mastering all other things in life and achieving sustainable success. Through her interactive workshops Carolyn supports people of all ages and all walks of life to develop empowering mindsets, winning attitudes, clarity about their goals and acquiring ever-greater levels of self-confidence.